The hottest -- and perhaps most ornery -- rockers in the land take over Joe Robbie Stadium tonight for New Year's Eve. More than 40,000 people are expected to rock away 1991 with bad boys Axl Rose and Slash, which means you should get there early to avoid the parking rush. Gates 2, 3, 5A, 5 and 6 open at 4:30 p.m. Parking is $5 for cars, $10 for recreational vehicles and $20 for buses and limousines. Stadium gates open at 5 p.m. Soundgarden, the opening act, is scheduled to hit the stage at about 7 p.m.
For parents and other anxious folks, there are special rules and provisions. No alcohol will be sold at the stadium. Can't bring it with you, either. Parking Gate 7, at the northwest corner of the stadium, has been designated a drop-off/pick-up area to make it easy for parents to drop off and pickup their kids. The curb-side service was implemented when New Kids on the Block came to town in 1990, and it was a big success, said Joe Robbie Stadium spokesman Eric Bresler. The drop-off area will be well lighted and patrolled, he said. To get to Gate 7, drivers should enter from 203rd Street off of University Drive. Those taking the turnpike should exit at Miramar Parkway. Security will be tight, Bresler said. Here are some stadium policies to remember: Tailgate parties are not allowed. Neither are bottles, coolers, hard containers of any kind, umbrellas, fire works, cameras, recorders, signs, banners or noise makers. Same goes for controlled substances. All concert goers are subject to searches. About 10,000 seats are still available. They cost $16.50 each, plus service charges, and are available at the stadium and Ticketmaster outlets. Prior to the start of the much-anticipated New Year's Eve Guns N' Roses concert at Joe Robbie Stadium the stage stood empty. A towering behemoth of gleaming metal and black fabric. The emptiness and sheer size of the stage offered a sense of foreboding. Fitting for the pending appearance of the primal fury that is Guns N' Roses. The field was dotted with security personnel in yellow shirts, but even with their presence apprehension hung in the air. Entering the field at a GN'R concert that close to the stage is akin to stepping into the ring with Mike Tyson. GN'R even has the audacity to bill this as the "Get In The Ring Motherf----- Tour". Now I know how the Christians must have felt squaring off against the lions. The Guns N' Roses that roared onto the stage with a fierce rendition of Welcome To The Jungle was a polished and professional machine. Gone were the excesses and boorish behavior that marred earlier dates of the tour -- namely the infamous St. Louis concert that sparked a riot last year. Axl Rose, lead singer and enfant terrible, is the child Mick Jagger and Janis Joplin never had. Jagger-like in his stage mannerisms, the man is possessed of an inexhaustible level of manic energy and flashy showmanship approximating Joplin-level intensity through his raspy, emotionally raw vocals. Rose is clearly the star of this outfit. Bursting onto the stage in a brilliant red jacket and minuscule red shorts, Rose was constantly on the move, sprinting up and down the length of the mammoth stage, throwing mike stands and leading his fellow Gunners in one explosive number after another -- the beastly You Could Be Mine, blistering Civil War, the mega-wattage of Live And Let Die and manic finale Paradise City in particular. Rose is also capable of tenderness, exemplified best on the ballads Don't Cry and the epic November Rain in which he surprised the audience with a stunning display on the piano before launching into the heartbreaking lyrics of the song. The band's brilliant new albums, Use Your Illusion I & II, paint a fascinating portrait of a man battling his demons. On this night Rose won out, even offering an uncharacteristic stab at humor when he donned a Mickey Mouse headpiece and crept up behind lead guitarist Slash during a solo. Slash himself is a brooding presence in concert. Decked out in beige leather pants and puffing a cigarette, he says few words and rarely acknowledges his adoring fans. He does offer razor sharp guitar licks that brought the 40,000-strong audience to its feet on Estranged and Sweet Child O' Mine. Few bands can fill a stadium with enough sound and fury to justify holding a show in such large venues. The Rolling Stones' flashy pyrotechnics and even Paul McCartney's silly love songs worked on those acts' last tours. Add Guns N' Roses to that list. In fact, as evidenced by Tuesday's show, put them on the top of that exclusive list. Axl and company conquered Miami with a vengeance, culminating at midnight with a brilliant display of fireworks in the sky that could have been lit from the sheer energy of the 2 1/2-hour show. MIAMI — Donning a paper party hat and tooting a plastic horn would have been a more exciting way to ring in 1992 than attending the Guns N’ Roses concert at Joe Robbie Stadium on New Year’s Eve. The Gunners, who took the stage surprisingly early at 9:30 p.m., exhibited lots of flame but little fire during their 2 1/2-hour show. While lead singer Axl Rose expended lots of energy running around the mammoth stage and the other band members banged away on their instruments, it didn’t add up to a very moving experience. Even the audience of 35,000-plus, which gave the band a thundering welcome, lost its initial highly charged spirit and settled into a ho-hum malaise. The crowd had high expectations after enduring the opening set of the Seattle quartet Soundgarden. Soundgarden, which unfathomably has a hit album, delivered a pathetic, abysmal set void of any hint of excitement or invention and had no business opening for a show of this magnitude. A number of local bands would have outshone these highly hyped noisemakers. Lead Gunner Rose, who certainly has shown a flair for the dramatic, equated hat and jacket changes and sprinting around the stage with working a crowd. But the constant changes and dashes across the stage often were distracting, and the band was not helped by an erratic sound mix. With drums, two guitars, bass, two keyboards and three horns, only the guitars and drums could be heard clearly. Drummer Matt Sorum earned the distinction Tuesday night of performing one of the lamest, most unimaginative drum solos heard in a decade. On the other hand, lead guitarist Slash is developing into a bona-fide guitar hero. He demonstrated an understanding of dynamics, the knowledge that speed is not everything and the ability to coax a variety of tones from his instrument. He also proved self-indulgent, taking too many long solos. The show had a few bright moments. The band’s signature song, Sweet Child o’ Mine, is a future classic and always a pleasure to hear. The new ballad November Rain, featuring Rose on piano, was delivered in intimate, provocative fashion. And a funky jam session near the show’s end livened up the crowd. Unfortunately, it was too little too late. 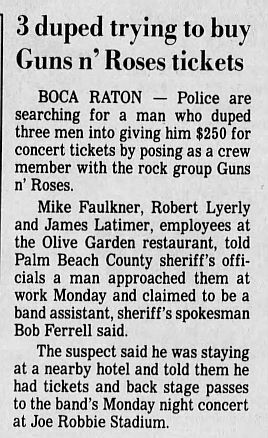 BOCA RATON - Police are searching for a man who duped three men into giving him $250 for concert tickets by posing as a crew member with the rock group Guns n’ Roses. Mike Faulkner, Robert Lyerly and James Latimer, employees at the Olive Garden restaurant, told Palm Beach County sheriff’s officials a man approached them at work Monday and claimed to be a band assistant, sheriff’s spokesman Bob Ferrell said. The suspect said he was staying at a nearby hotel and told them he had tickets and back stage passes to the band’s Monday night concert at Joe Robbie Stadium.